Giant Lion In Texas May Be King Of All Football Field Logos : The Two-Way A newly outsized logo is part of a Texas college's broader plan to change the fortunes of its football team. The Lions of Texas A&M University-Commerce won only a single game last year. 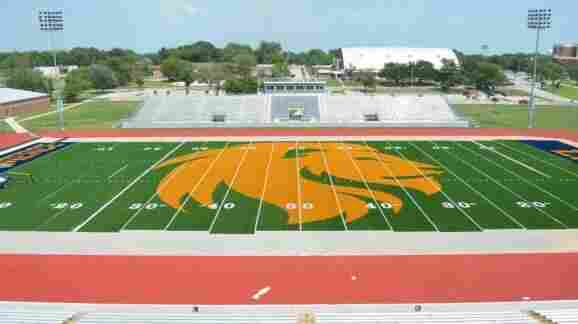 At 50 yards wide, a new lion dominates the new field at Texas A&M University-Commerce's Memorial Stadium. "That's a big ol' lion." How else to describe the new golden cat on the field at Texas A&M University-Commerce's Memorial Stadium that stretches from sideline to sideline, dominating the area between the 25-yard lines? That description of the giant cat, which may be the largest on-field logo in America, comes from Mark Haslett of NPR member station KETR, which is based at the school in eastern Texas. The new logo is part of A&M-Commerce's broader plan to change the fortunes of its football team, which last year won only a single game in the NCAA's Division II. The team has a chance to defy its critics this season, as the Lions have been picked to finish last in the Lone Star Conference. In addition to super-sizing its logo, the university had hoped to make its field blue instead of green, to match its school colors. "But that plan was punted," Haslett writes, "apparently because Boise State University is behind some obscure prohibition of any NCAA football fields other than its own being blue. Boise State's Bronco Stadium has had its unique blue turf since 1986." A look at the NCAA's rules about football field decorations finds no limits on the size of on-field logos, with the ruling body's main concern being that any images not obscure important field markings such as yard lines — a rule obeyed by the designers of A&M-Commerce's new field. If a glance at the above photo from the university causes some alarm among our more detail-oriented readers who spot a major snag on the field — one that could possibly lead a disoriented player to run the wrong way — it seems the university has spotted it, as well. When the photo was taken, the 30-yard line on the left section of the field had its arrows pointing in the wrong direction, toward midfield. The NCAA recommends painting white directional arrows "next to the field numbers (except the 50) indicating the direction toward the nearest goal line." A visit to a live webcam stream set up by AstroTurf, which designed the field, shows that the errant arrow seems to have been removed. We assume workers will soon point things in the right direction on the field.